Basically I wanted to be able to login with my AAD (Azure Active Directory) user. In the first step, the database needs to be configured for Azure Active Directory in order to add users in the second step. In the Azure portal go the the SQL server and search for “active directory” to add an Active Directory admin. 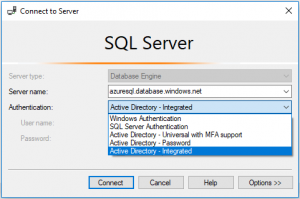 After you’ve added an admin and saved the value, you will be able to use SSMS (SQL Server Management Studio) to logon to the server. Probably SSMS will prompt you about a firewall exception. 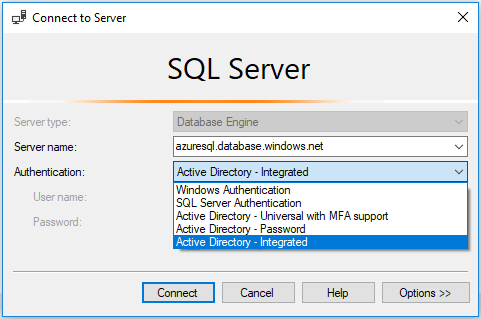 For other users (not the administrator we configured above) to be able to logon, access has to be granted like with an on premises SQL Server. Next grant permissions to the user on the database itself. Open another query on the database. What a week. Two hackathons (‘hack’+marathon) in a row. That was exhausting. 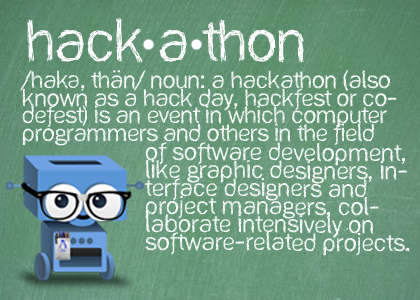 A three day hackathon with my colleges from Arvato Systems and a customer. We’ve used Cognitive services with 8 different programming languages and created great PoCs. The second hackathon was about Azure Stack with Microsoft. Thanks to all participants, the organisation. It has been fun and a great experience. Now I am looking forward on how the results will influence decisions for follow-up projects. Es ist wieder soweit. Am 18.7. um 18h treffen wir uns wieder. Auch dieses Mal sind wir wieder zu Gast bei Arvato Systems. D.h. dass ich eine namentliche Anmeldung benötige. 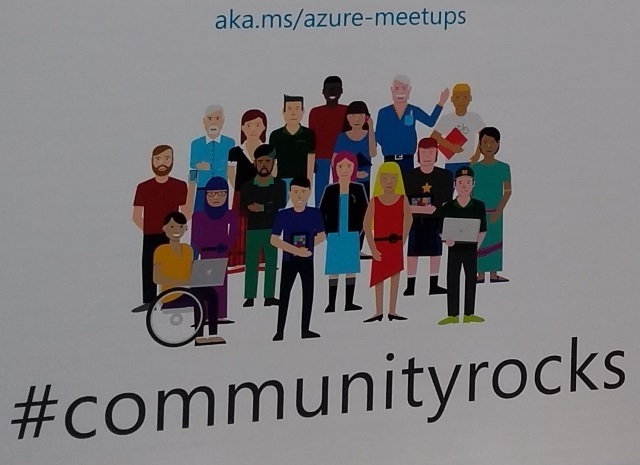 Deshalb meldet euch bitte über unser Meetup (https://www.meetup.com/Azure-Meetup-OWL/events/251641785/) oder per E-Mail an. 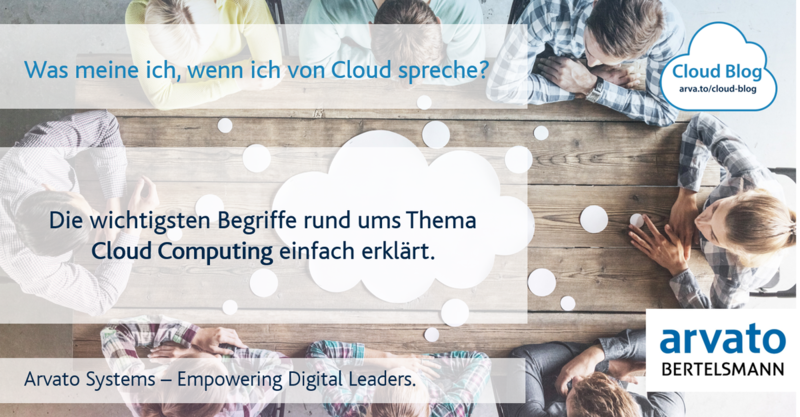 Softwareentwicklung in der Cloud. Was ändert sich? Vielen Unternehmen ist der Start in die Cloud bereits geglückt – oder es wird intensiv daran gearbeitet. Spätestens jetzt wird klar: Die Cloud ändert so einiges. Ein guter Zeitpunkt also, um darüber nachzudenken, wie wir mit Cloud-Technologien eigentlich umgehen wollen. 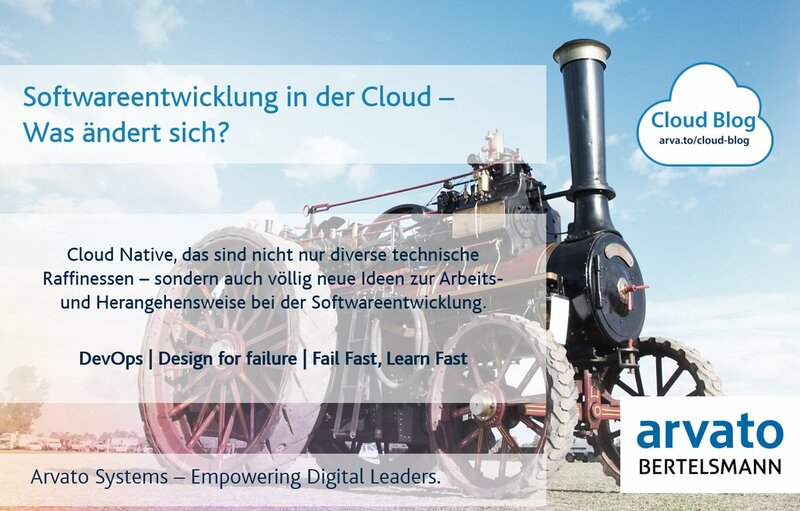 Den Artikel habe ich auf dem Arvato Systems Cloud-Blog veröffentlicht. Mit dem Thema “IoT – Raus aus der Update-Hölle” bin ich als Sprecher auf der https://www.iot-konferenz.de im Oktober in München unterwegs. Im Zeitalter der Digitalen Transformation umschwirren uns unzählige neue Buzzwords. 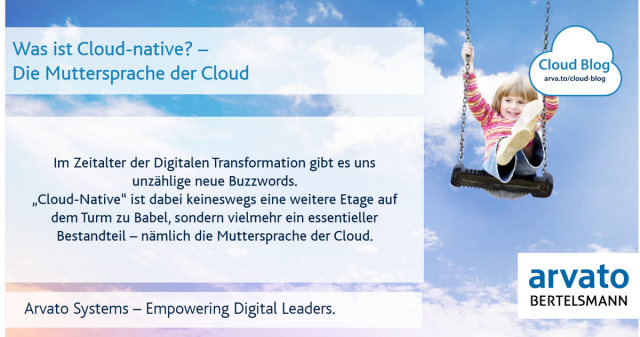 Bei „Cloud-Native“ sprechen wir dabei keineswegs von einer weiteren Etage auf dem Turm zu Babel, sondern vielmehr von einem essentiellen Bestandteil der Digitalisierung, nämlich der Muttersprache der Cloud. Today I wanted to query entities of an Azure Table via REST Api and did not get any results. Looking over the query over and over again did not solve the problem. Sometimes I did not get any items back. The “sometimes” depended on the query. I checked each part. Partition Key, string and date columns. Everything looked all right. And then it hit me. I did not get a result, if there was too much data. Specifying the $top option to 1000 will always return data. Am Donnerstag (22.3.) 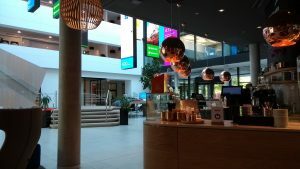 treffen wir uns wieder: Use-Cases für Stream Analytics und Azure Databricks. Am 24. Januar ist es wieder soweit. Bitte denkt an die Anmeldung über die Webseite, damit wir euch beim Pförtner anmelden können. So I looked for the part number CTR-30B, which is printed on both parts of the tree. I found a couple of instructions. After I soldered the tree, I saw that the colors were not evenly bright. I adjusted the values of the resitors and want to share the values. For R1, R3, R5 and R7 I used the provided 10k resistors. Uploading files to a NodeMCU ESP8266 can be done with the Java tool ESPlorer. If you want to automate this process, you’ll want to use something else. Fortunately the bash allows access to the COM ports. You have to modify the permissions for the device though. After that, the COM port can be access. The uploader can be installed with pip. Set-AzureWebsite : No default subscription has been designated. Use Select-AzureSubscription -Default <subscriptionName> to set the default subscription. Reminder: Always check for the magic “Rm” chars in the command, if a resource cannot be found. Nicht vergessen. 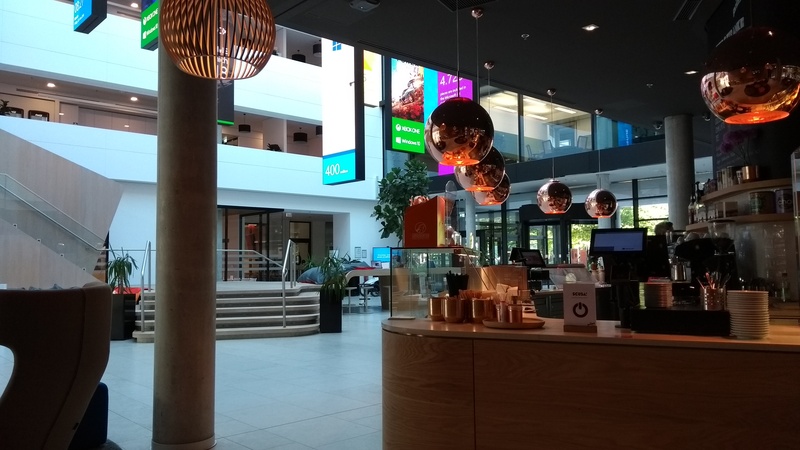 Morgen findet das Azure Meetup zum Thema Build, Test und Deployment mit Azure in Bielefeld statt. A Runbook schedule can be triggered every hour. 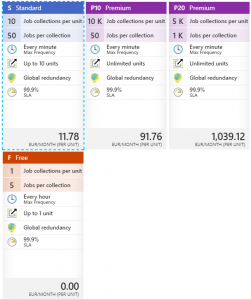 If you need a smaller interval, like every minute, you can use the Azure Scheduler to do so. So I went to the Azure Portal, created an Azure Schedule instance (with a job collection tier of at least basic, to be able to create schedules that are triggered every minute) and called a Runbook via webhook. Azure cmdlets can be made available through the Automation Account the Runbook is using. The “Browse Gallery” link will let you find and choose the necessary cmdlets. The error message above appears, because a) the cmdlet was not installed and b) the referenced version of AzureRM.profile was to old. Fortunately the problem can be resolved easily by upgrading the Azure modules. In case you need the ServiceObjectiveId for SQL standard tiers, here is the list for you. Usually you could change the tier within the Azure Portal. To change them via PowerShell, you can use the above IDs. 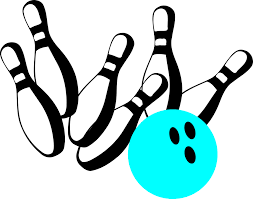 Connect-ServiceFabricCluster : An error occurred during this operation. Please check the trace logs for more details. you need to import the certificate with its private key (*.pfx) into the personal certificate store of the PC you are running PowerShell on. Specifying -verbose for PowerShell will print additional information, that does not help a lot. I’ve published an article on the Arvato Systems Cloud Blog (German) and Arvato Systems Blog (English). Ihr Unternehmen plant eine großangelegte Digitalkampagne zur Vermarktung eines neuen Produktes? Sie sind nicht sicher, ob die aktuelle Architekturlösung den Ansprüchen ihrer geplanten Kampagne gerecht werden kann? Bei einem Ausbau Ihrer Infrastruktur würden hohe Kosten auf Sie zukommen? 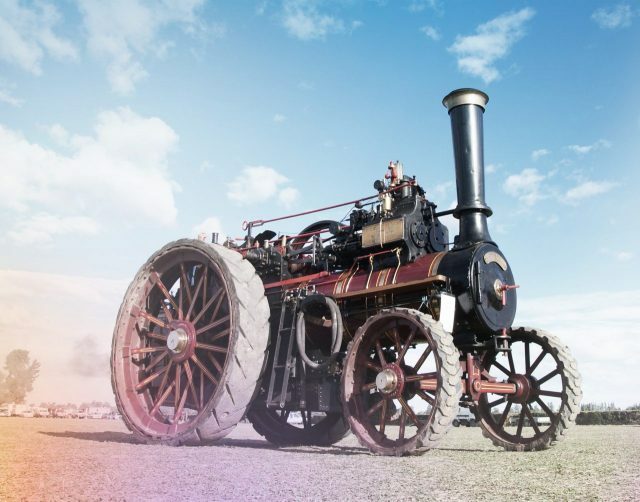 Is scaling up your existing infrastructure very expensive? Are you not sure if your infrastructure can meet the demands of your next big marketing campaign? Get to know an alternative to scale up your current environment for a short period. Often there is no need to set up an infrastructure like a web server, database server, and load balancers. Let us take a look at some cloud providers and how they can serve our content more cost efficient and deliver websites to the visitors with high performance. Vermutlich wird es um Chatbots und Machine Learning gehen. Wir werden aber auch auf euer Feedback eingehen um Themen für die nächsten Treffen zu finden. 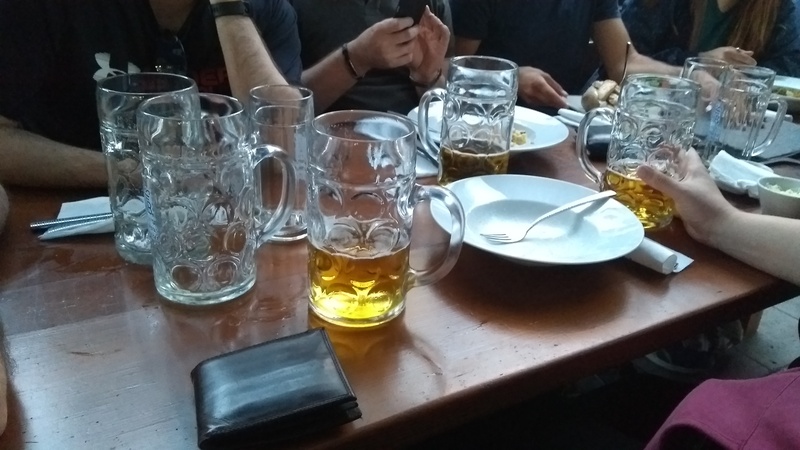 Wenn ihr dabei sein möchtet, meldet euch bitte über die Meetup Seite an. Es wird um eine namentliche Anmeldung gebeten, da die Besucher beim Pförtner angemeldet werden müssen. Bitte entweder über Meetup, oder sendet mir eine E-Mail. If you’d like to send transport layer encrypted email with you SharePoint farm, you can do so by installing a .NET update and modifying the registry. The concept of Add-Ins (formally knows as Apps) in SharePoint puts logic as HTML and CSS to another page. 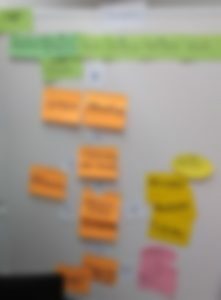 This page is then rendered as iFrame to another SharePoint page. This approach has advantages and disadvantages. You have to decide yourself. A very promising way to put stuff (or WebParts) onto a SharePoint page is the Widget Wrangler. More information can be found on https://dev.office.com/blogs/introducing-widget-wrangler. How to use Widget Wrangler with jQuery? How to use Widget Wrangler with KnockoutJS? How to use Widget Wrangler with Angular? 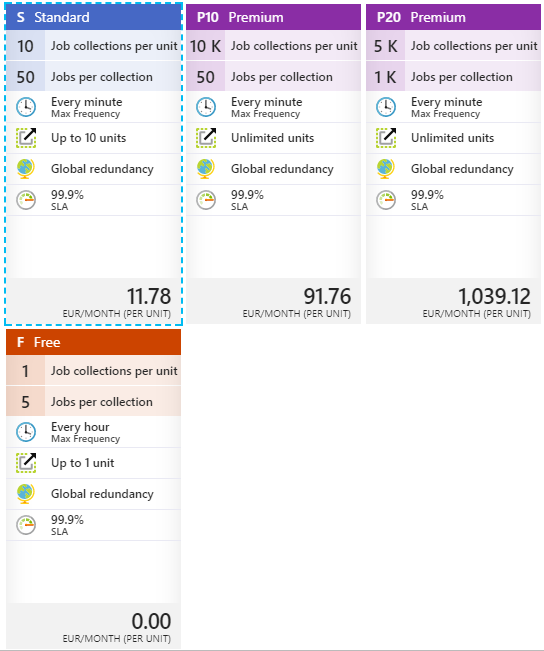 How does Widget Wrangler handle multiple instances of same widget in the SharePoint Pages? I like that. As soon as I’ve some spare time, I will take a close look. After a SharePoint 2010 to SharePoint 2013 migration our users complained, that in the multiple Active Directory domain environment they havethe People Picker does not resolve the users the same way it did earlier. Only a subset of the users was resolved, users from a few domains were not included in the results at all. es ist so weit. Nach einigen Abstimmungsrunden möchten wir Sie nun am Dienstag, 01. September 2015 zu unserem nächsten Treffen der SharePoint UserGroup OWL herzlich nach Gütersloh einladen. Das Treffen findet wie beim letzten Mal auf dem Campus von arvato Systems im Raum Barcelona / Madrid im Tower I statt und startet ab 18 Uhr. Um Ihnen einen reibungslosen Zutritt zum Firmengelände zu gewähren, bitten wir um Ihre namentliche Anmeldung auf Xing, damit wir Sie beim Pförtner vormerken und natürlich auch für Ihr leibliches Wohl sorgen können. A detailed comparison of the version is available here.